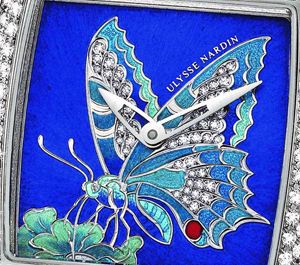 Butterflies in limited quantities.Ulysse Nardin blessed "28 playful glamorous women. 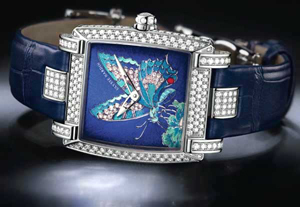 This year Watchmakers gladly decorate dials its new models depicting butterflies. That there are at least debutants Baselworld-2012 Blauling, elegant summer Aerowatch or stimpankovskie ArtyA! However, all of them easily bypasses luminary in the art of enameling – Ulysse Nardin. Dial novelty Caprice Butterfly Created with Enamel Champleve: indentations in the metal plate manually filled with colored enamel, excess removed, and the drawing is exposed to high temperature. Three shades of blue used in the design, perfectly in tune with a scattering of white diamonds (353 stones weighing 3.8K). Crowned composition bright red berry – the thinnest spot on the fire butterfly’s wing. Time show sharp skeletonized hands and hour-markers are not available, so as not to interfere with lovers to enjoy the beauty. The dial is protected by sapphire crystal. The crown is decorated with pearls. Case dimensions of 18-carat white gold – 34×35.4mm. The back cover is transparent. Range – 42 hours. Water resistant – 50m. Clock mounted on a blue leather strap with folding clasp in 18-carat white gold. Limited edition women’s mechanical watch Caprice Butterfly has 28 copies.